Passover is one of three biblical holidays we celebrate to remember Christ's death and resurrection. 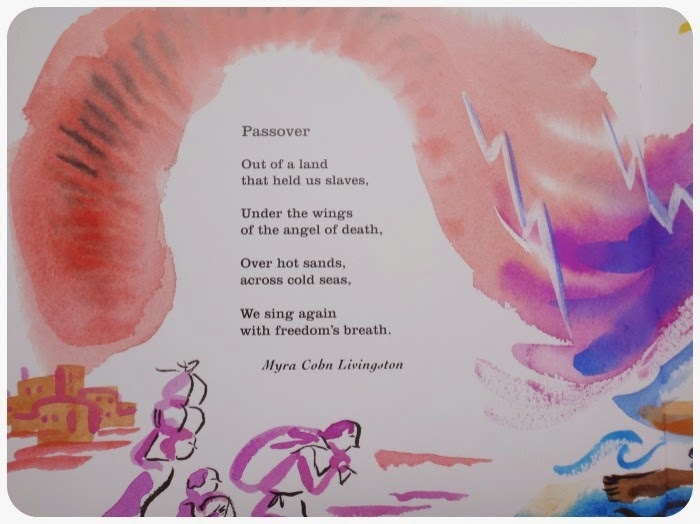 This week, we celebrate the days coming up to Passover, which we will celebrate on Saturday evening. That is followed immediately by the Feast of Unleavened Bread, then First Fruits. Unleavened Bread lasts 7 days. 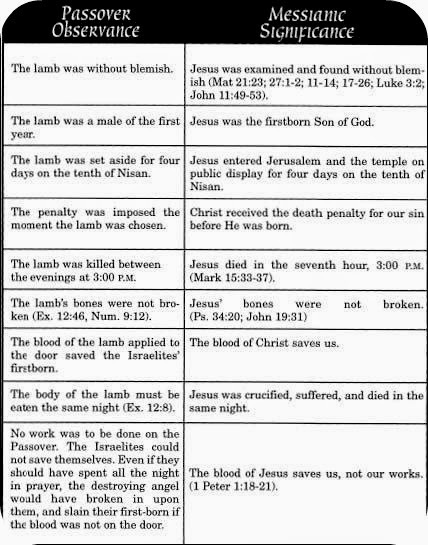 Yes, Christ is the lamb who was sacrificed on Passover! Praise His name. 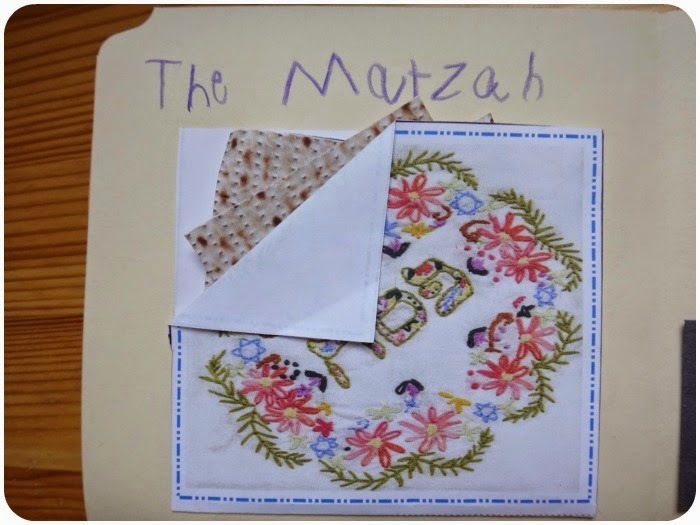 Because Unleavened Bread and Firstfruits are actually separate Feasts from Passover, I hope to include a second part to this post, offering ideas for embracing those celebrations. 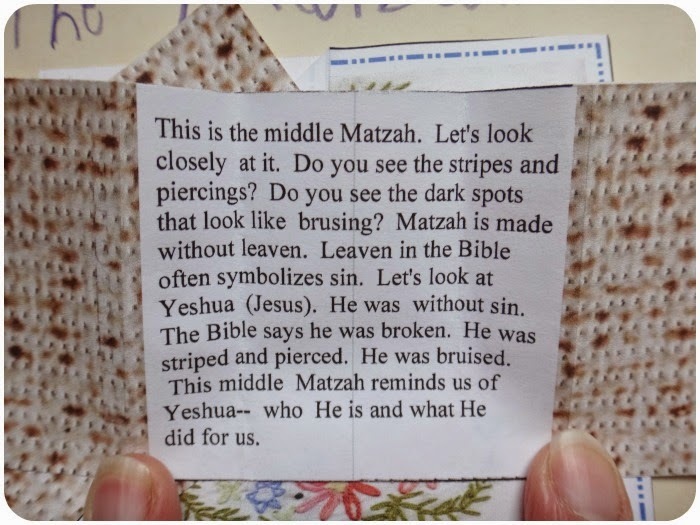 For this one though, I'm focusing on Passover. We are embracing feasts that were established in the Old Testament, honoured by Christ Jesus, and prophesied of the wonderful, amazing truth of Christ, our Saviour. 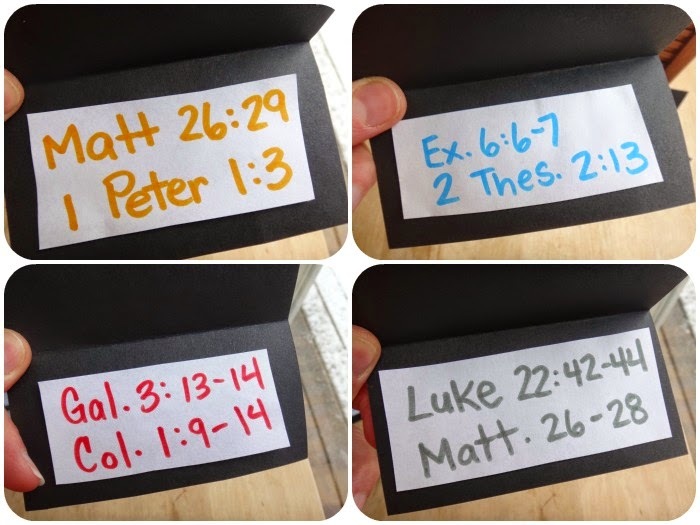 One thing I had to wrap my mind around when we started embracing the biblical feasts is that the Hebrew Calendar is not the same as our calendar so Passover (along with all the other feasts) will almost never fall on the same day or day of the week in our 'Roman' calendar. 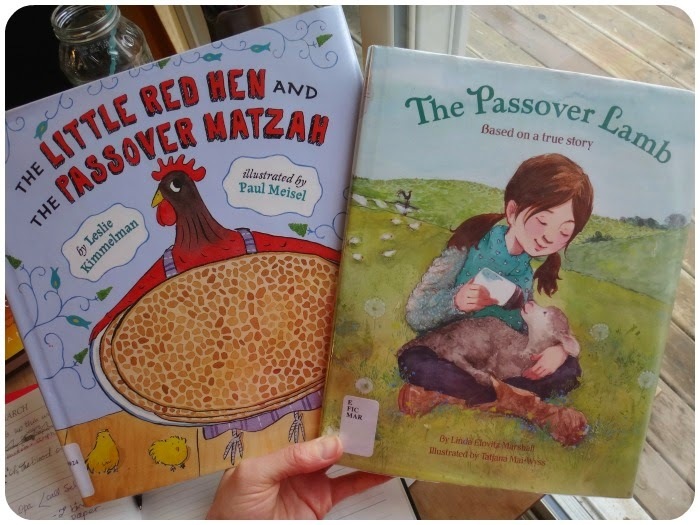 This year Passover and "Easter" are very close in timing, however, many years they are up to a month apart. 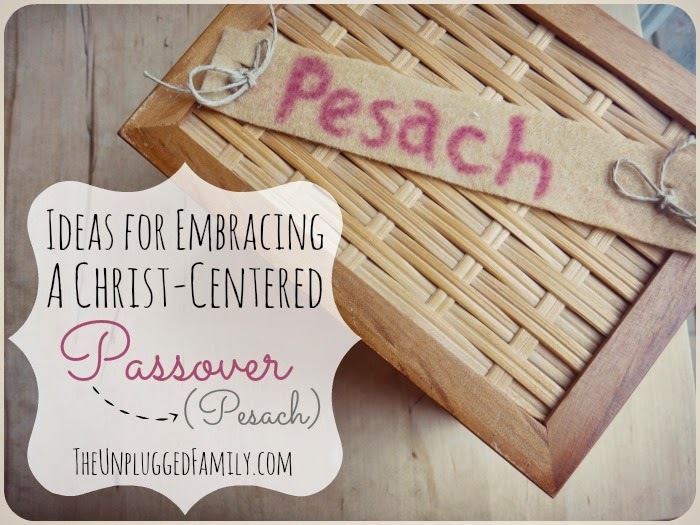 So... here are some of the ways we are embracing a Christ-centered Passover this year. My sweet friend Robin at Heart of Wisdom was so kind to give me a copy of Adam to Messiah for review. I was in the midst of reading through the volumes to post a detailed review (coming soon!) 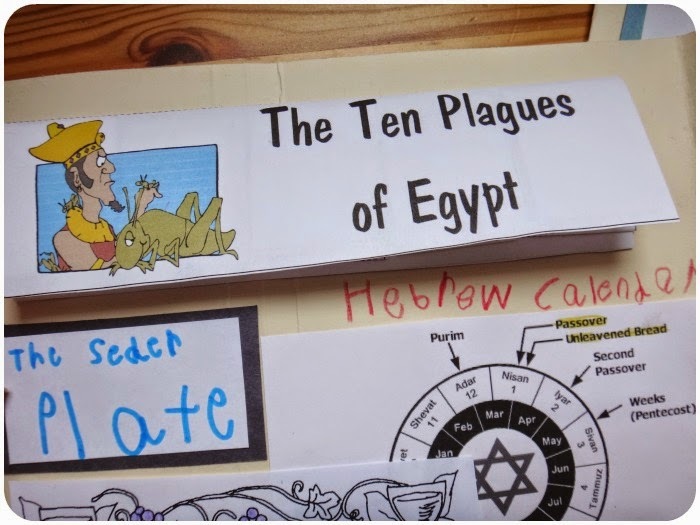 when I was prompted to check for a lesson related to Passover. I flipped to the Ancient Egypt Book and voila! So, we'll be using this lesson for this week. Maybe this is a mini 'plug' for the Adam to Messiah curriculum, because WOW do I love this! 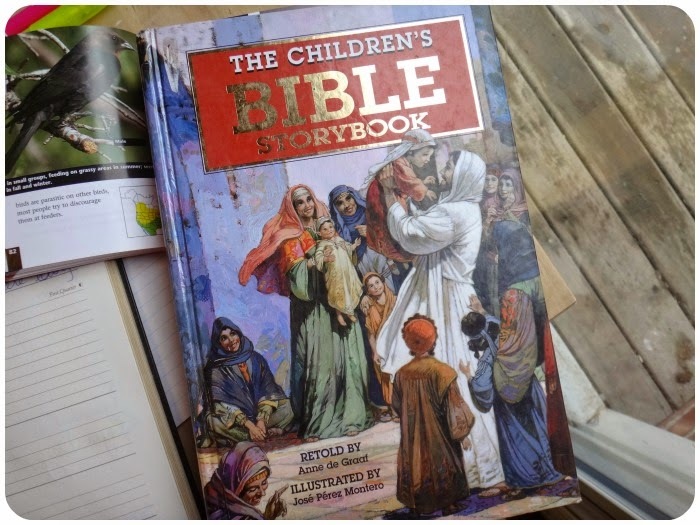 I am so excited about implementing this into our homeschool!!! 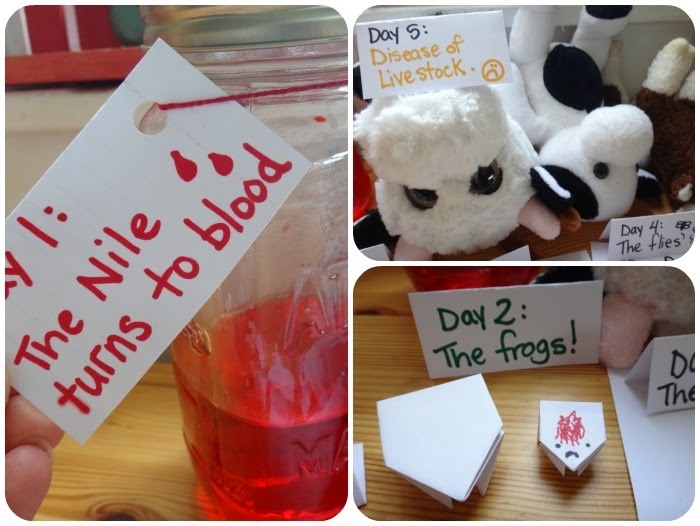 -Make a list of the plagues, from memory if possible. Then read Psalm 78. 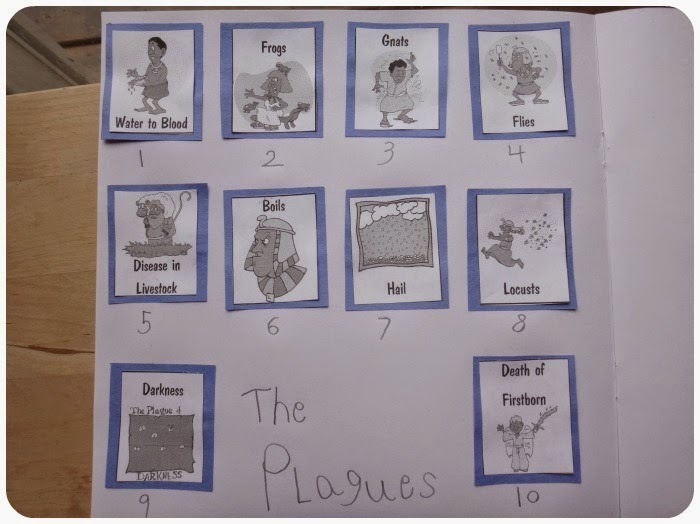 Which plagues are mentioned? 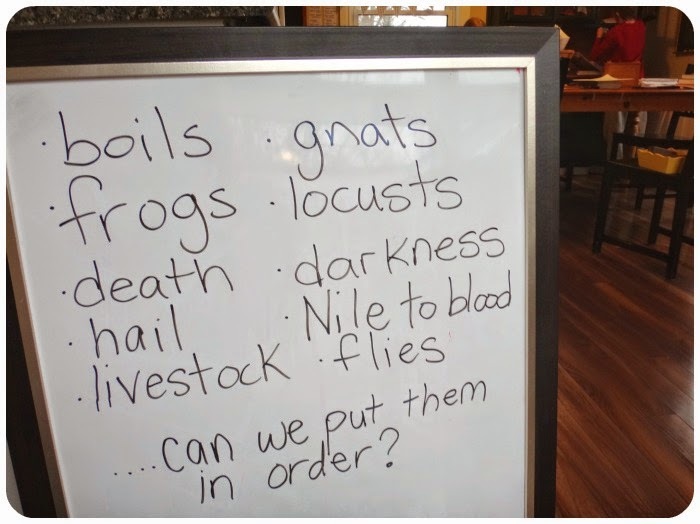 -Once the plagues are listed (on chalk board), I will hand the children their own little pictures of the plagues, which they will attempt to put in order (by memory). -Reading through the account of the exodus found in the Old Testament. -We will also discuss the prophetic and deeper meanings to the plagues. For example, the Nile was the Egyptians' idol which God defeated by turning the Nile to blood. The blood is also a symbol of how blood thirsty and sinful the Egyptians were to slaughter the Hebrews' children. The frogs represented the fertility goddess, Isis. 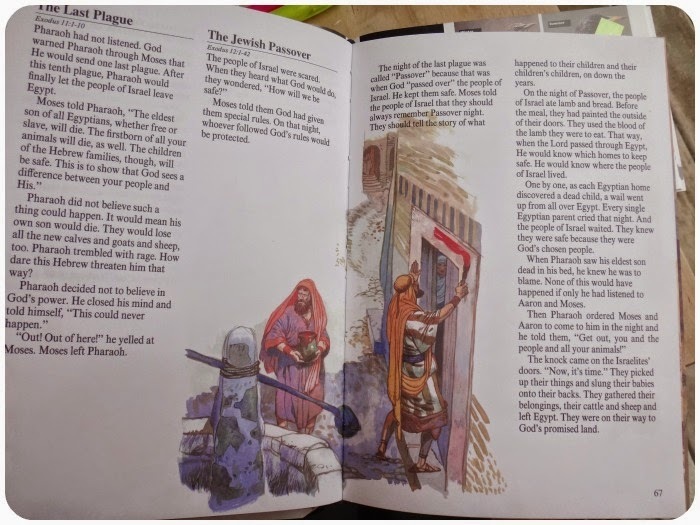 Once the plague came, the dead frogs, which we supposed to symbolize life, were left in heaping piles as a reminded of God's supreme power and glory over the false gods of Egypt. 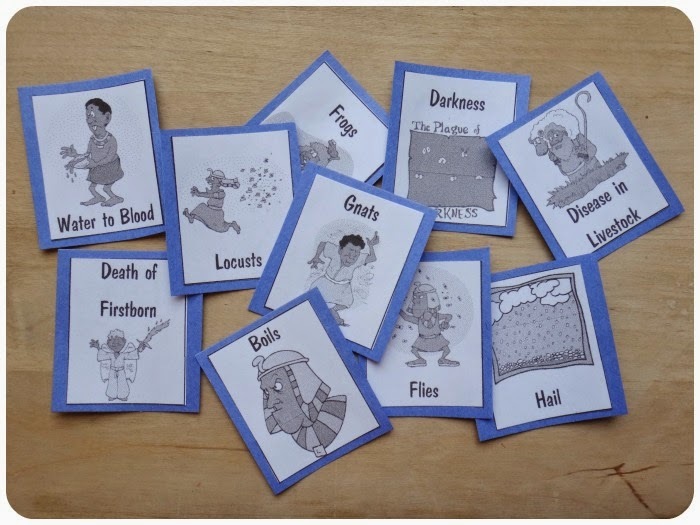 Can you think of the 10 plagues from memory? Can we put the plagues in order? 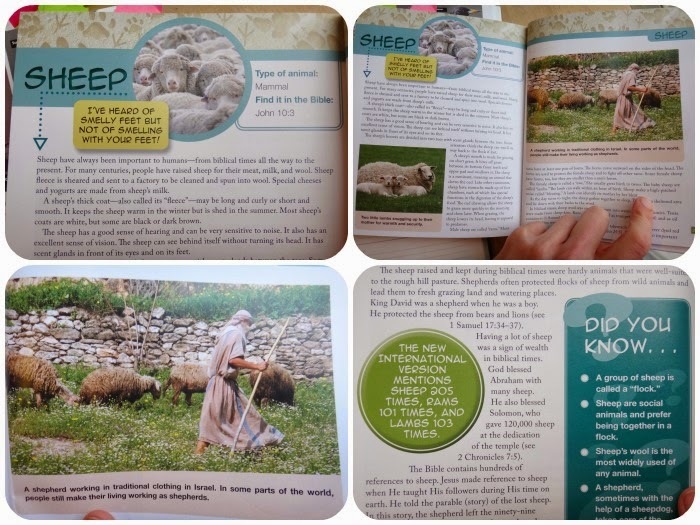 I got this bible on discount years ago, and it has been one of our favourites! 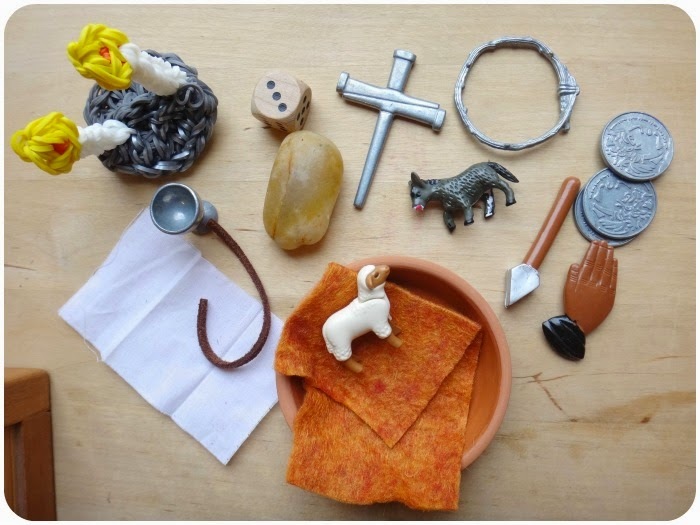 I love all these little symbolic pieces, each one representing a part of the story of Christ's death and resurrection. They are so tactile and the children are filled with memories upon taking them out of the box. I salvaged these from our old 'Resurrection Eggs'... 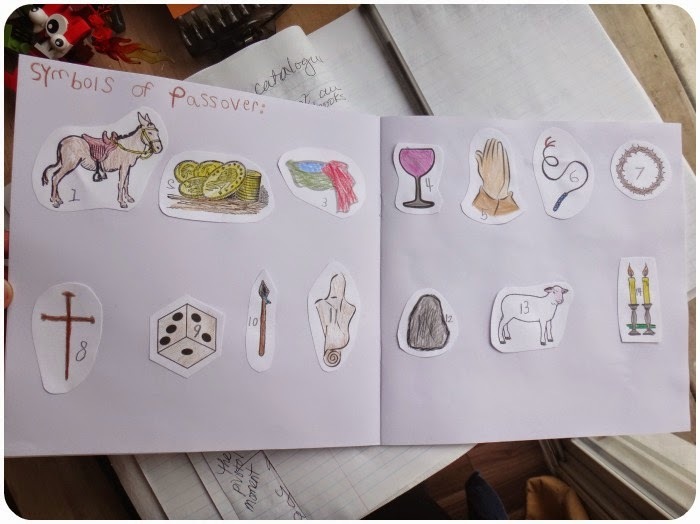 I wasn't comfortable with the eggs but still felt the symbols were very fitting for Passover so I saved them, and I'm glad I did. You can easily find many of these things around the house or make them out of crafting items. I encourage you to be creative! The Donkey reminds us of Christ's entry into Jerusalem. The Coins reminds us of the thirty pieces if silver Judas received for the betraying of Jesus into the hands of the Jewish leaders. The cup reminds us of Jesus last supper with his disciples before His crucifixion. It was what was used for the wine, which is drunk in memory of Christ's blood that He shed for us and our sins. The praying hands reminds us of Jesus visiting the garden of Gethsemane to pray. The leather reminds us the whip used to give Jesus 39 lashes after His trial by Pilate. The crown of thorns reminds us of the crown that the soldiers placed on Jesus' head while mocking Him. The nails remind us of the nails that were driven into Jesus' hands and feet to nail Him to the cross. The dice reminds us of the Roman soldiers gambling for Jesus' robe. The spear reminds us what the Roman soldiers used to pierce Jesus' side when He was on the cross. The gauze reminds us of the linen cloth used by Joseph of Arimathea to wrap Jesus' body after He died on the cross. The stone reminds us of the tomb were the stone rolled away. 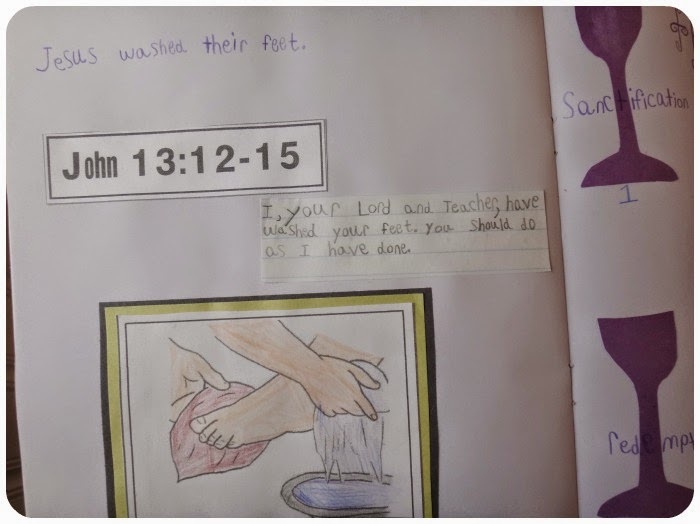 The basin and towel reminds us of how Jesus washed the feet of His disciples on the night before He died. The lamb reminds us that Jesus is the Lamb of God, the One True Passover Lamb who died once and for all so we may be cleansed of our sins and draw close to the Him. The two candles are the Sabbath Candles that remind us that Jesus is the Light of the World. 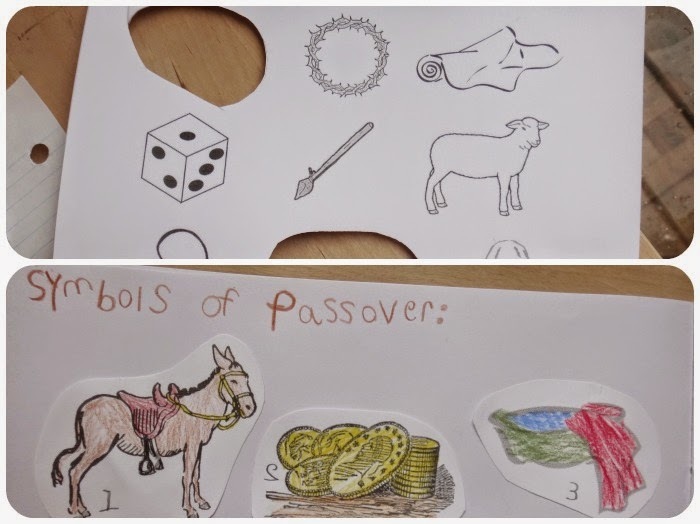 I found all the symbols in clip-art form and printed them off for the children to put in order as we work through all the symbols in our Pesach box. For our celebration of the Last Supper (Passover dinner), we plan to enjoy a special meal together. We don't do a traditional Sedar. There are many parts of the Sedar that I don't necessarily feel prompted to embrace at this time. 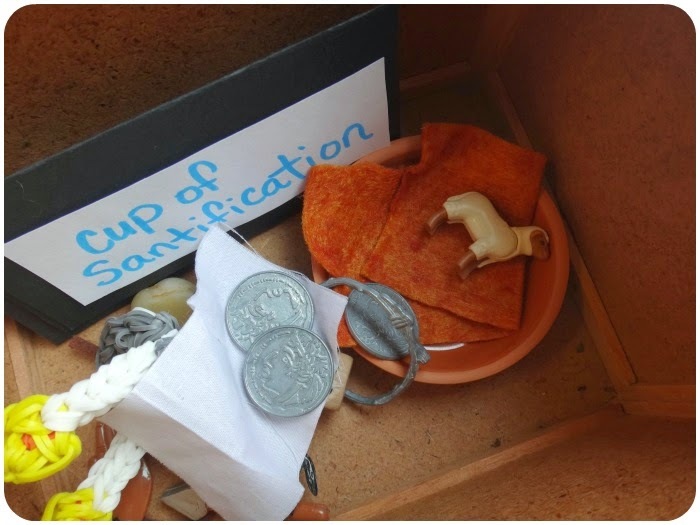 For us, we focus on the Bread and the Cup as Christ said these two things were symbolic of His body and His blood. 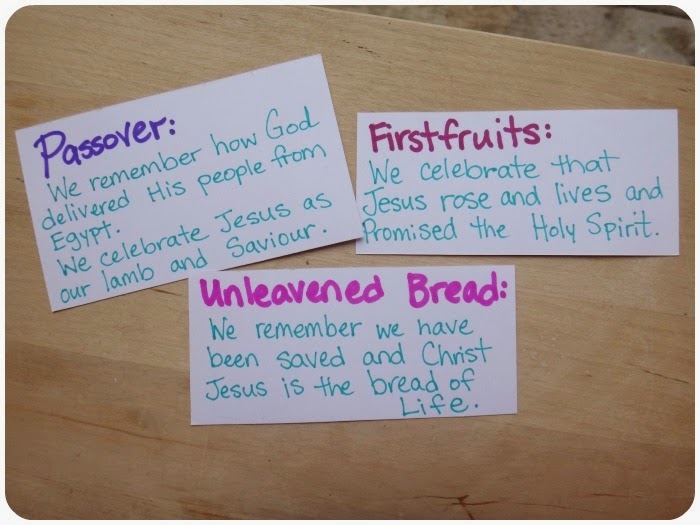 We will eat Unleavened Bread together and read through many scriptures together to remind us of what Christ Jesus (Y'eshua) has done for us through His sacrifice. We will also embrace and discuss the four cups. 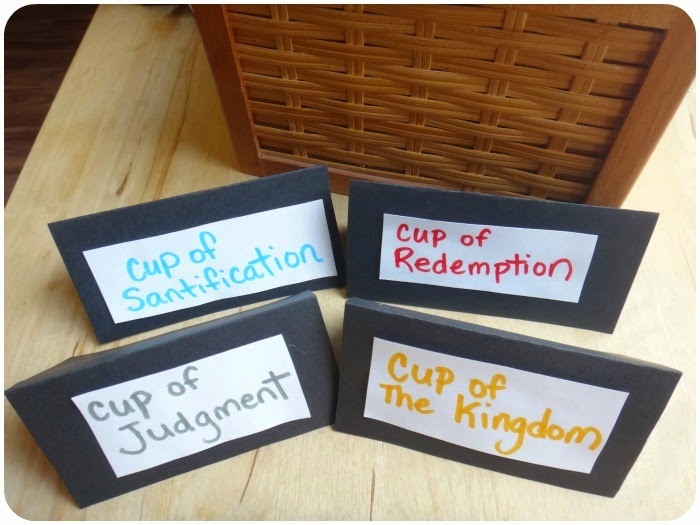 Each cup has deep significance and are referred to in Exodus 6. 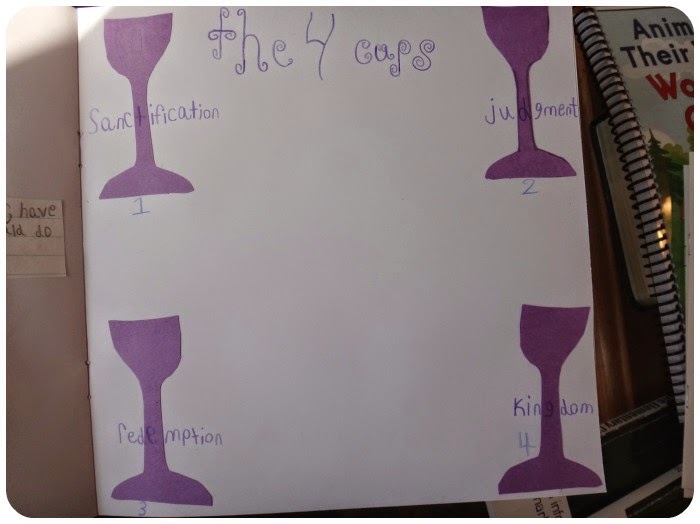 We will have 4 separate wine glasses with grape juice and will read through the assigned readings together. This is also when we will search for Leaven in our home and prayerfully do our best to rid our home of leaven for our embracing of the Feast of Unleavened Bread. 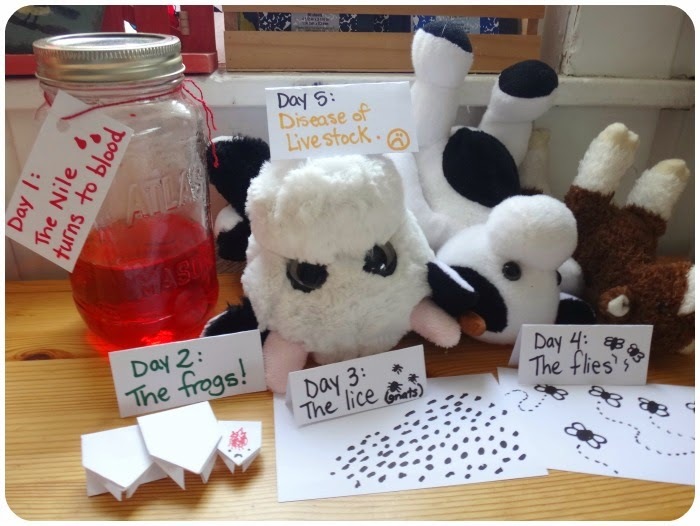 We have been following (loosely, mind you) the ideas shared here for the 10 Plagues Adventure. We are only on Day 5, but it has been really neat to see the kids make the connections. reading through all of the account of the Exodus and the Passover as well as scriptures referring to Christ's death and resurrection as well as references to Christ as the Lamb, and as the Shepherd. making our flags for Passover, Unleavened Bread and Firstfruits. reading through corresponding sections of the Victor Journey Through the Bible. 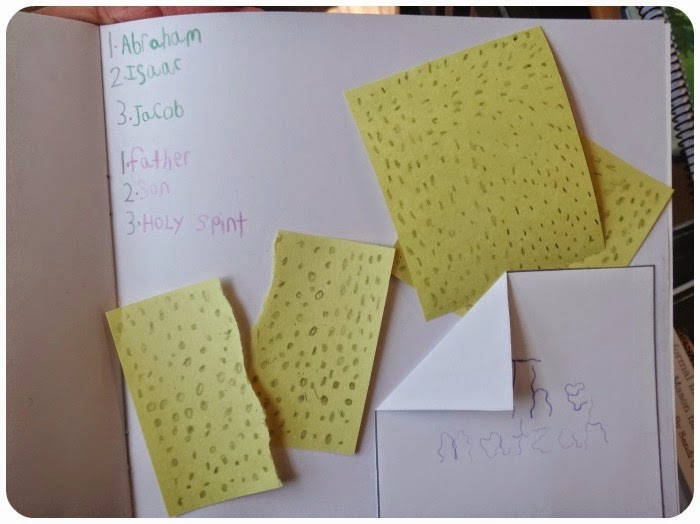 Copywork with scriptures and art. 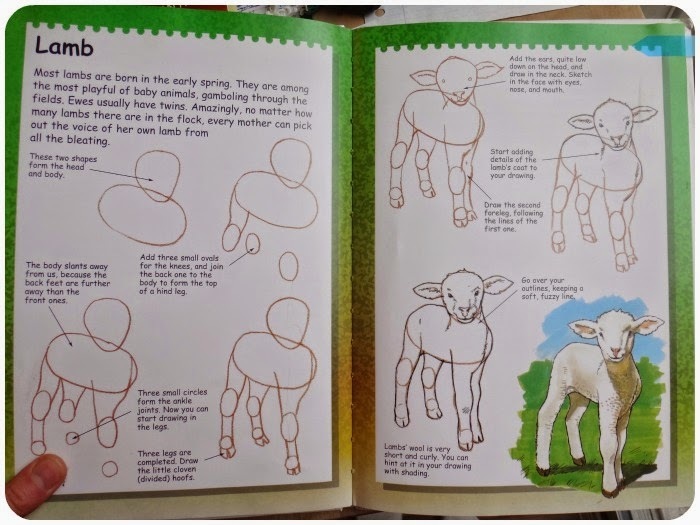 We will start with John 10:11 and a picture of a lamb from Draw Write Now. 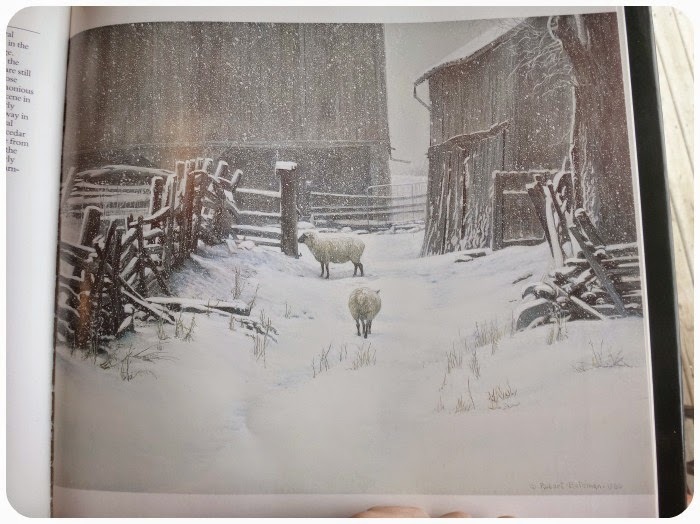 Picture study, a painting by Robert Bateman. 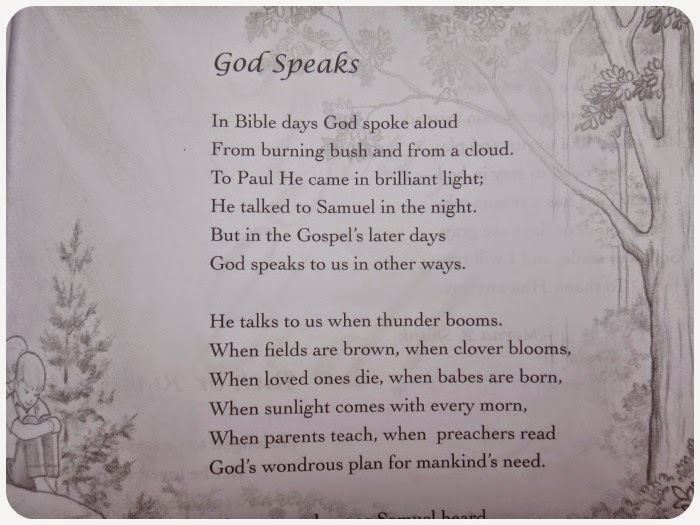 We love this Poetry book from Christian Light Publications, highly recommend it! 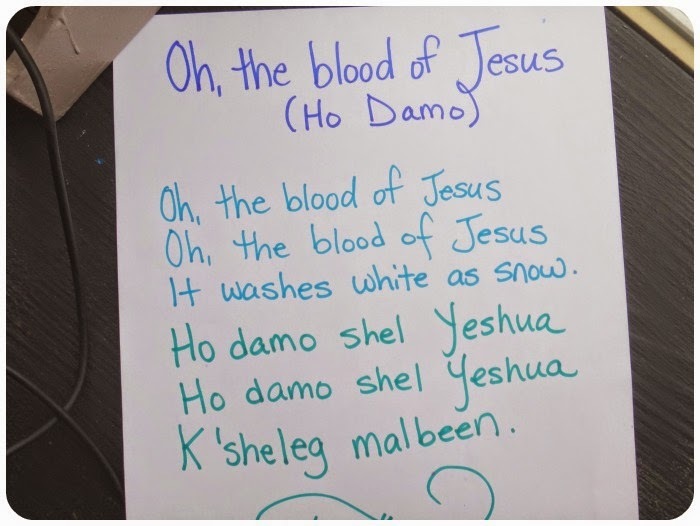 We will work at learning the words in Hebrew to "Oh, the Blood". We love Joshua Aaron and use his cds to not only worship the Lord, but learn Hebrew! 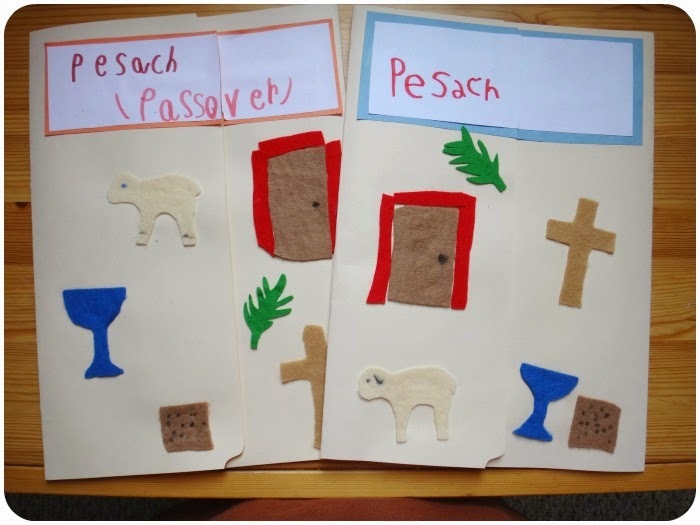 We will also be doing a neat activity, matching the truths about how Christ Jesus is displayed in every part of Passover. We will be using this chart from A Family Guide to the Biblical Holidays. I highly (HIGHLY) recommend this book if you are looking to embrace the feasts, it has been a huge blessing to us. 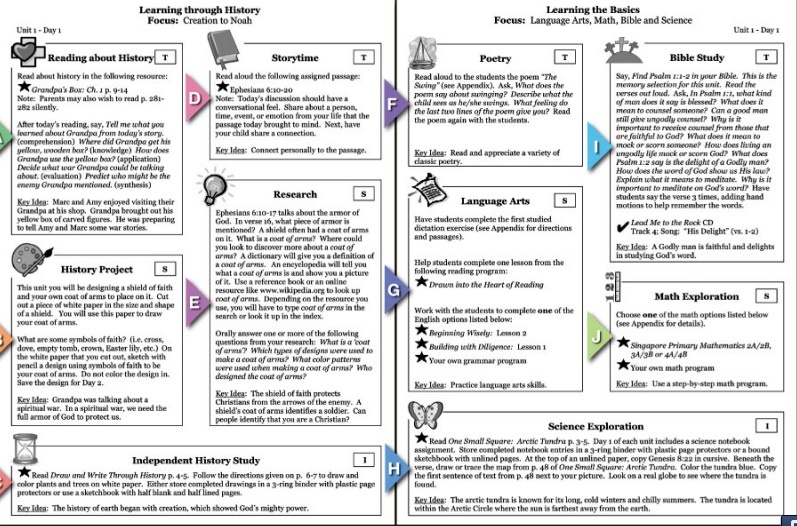 I created this for our lapbooks. Hello, friends! So, it's an exciting time of year for many homeschoolers as the Spring planning season is upon us. Catalogs and Vendor Halls and Conferences, OH MY! This year, I spent most of January and February praying, researching, and planning. This was mostly done while feeding a precious baby in the middle of the night. *wink* We had a beautiful baby boy join our family in December through adoption and it has been a wonderful whirlwind! I haven't done babies for 8 years... but we are back in the swing. And loving it! I realized quite quickly, however, that I couldn't possibly put together all my own plans this tear. And actually, I didn't want to. We prayed for years for this baby in my arms (yep typing one-handed...) and I want to spend as much time as possible holding, cooing, and cherishing and as little time possible planning, printing, scheduling. 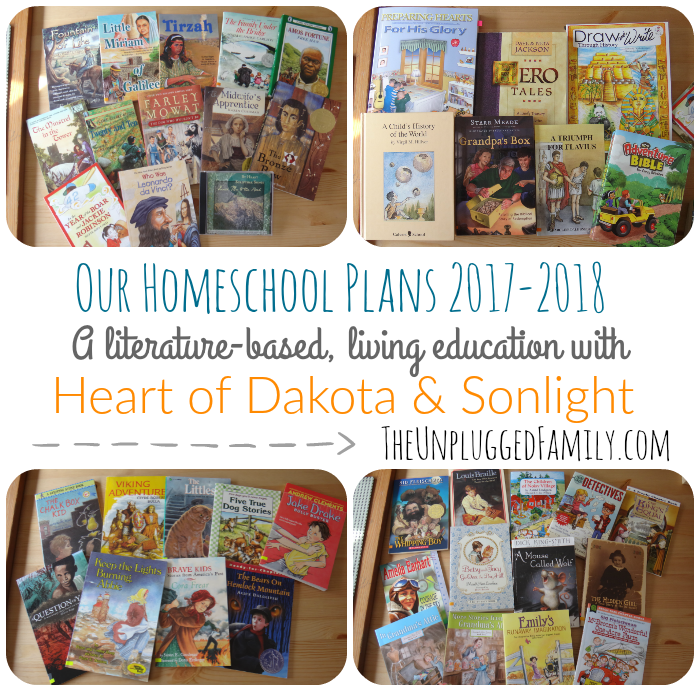 I previously used and reviewed Sonlight and Heart of Dakota. 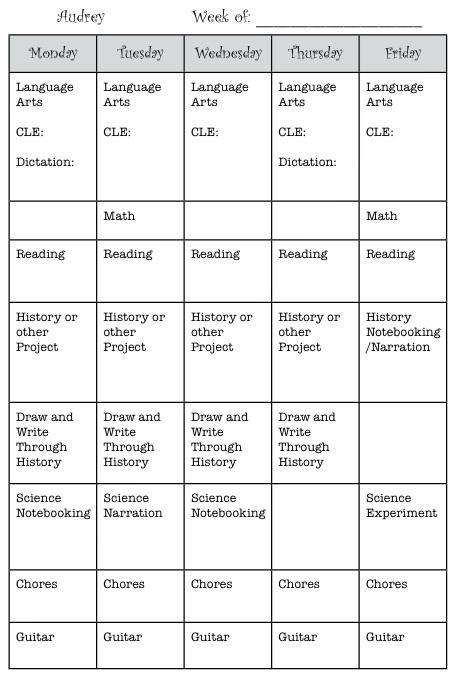 So, I already knew I liked these curriculum choices. I knew Heart of Dakota would give me what I needed. 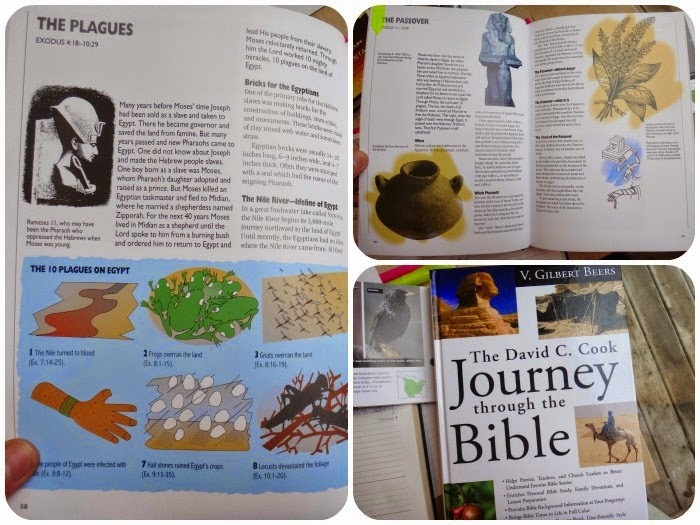 I knew Sonlight would enrich our learning with wonderful literature, meaty history books, and some great maps, vocabulary ideas, and discussion prompts. So - this year, we are doing Sonlight Core B+C along with Heart of Dakota's Preparing Hearts for His Glory together as a family. 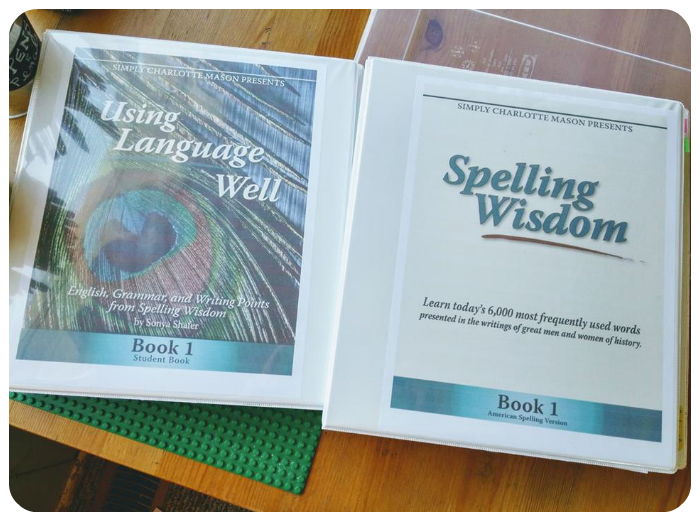 All three of my bigger kids (age 12, 10, 8) will be doing these programs together with their individual Language Arts, Math, and Reading mixed in. Sonlight gives a weekly grid style schedule of readings from wonderful books. 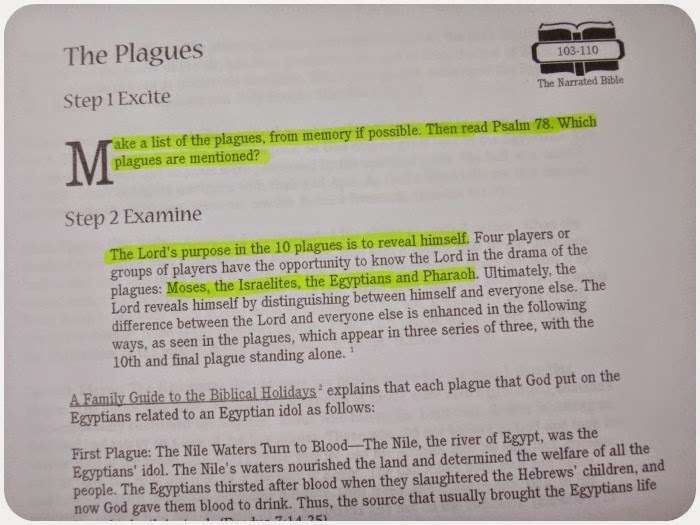 These include the subjects of Bible, History, Geography (mapping), and Literature. There is usually a poetry book or two mixed in. 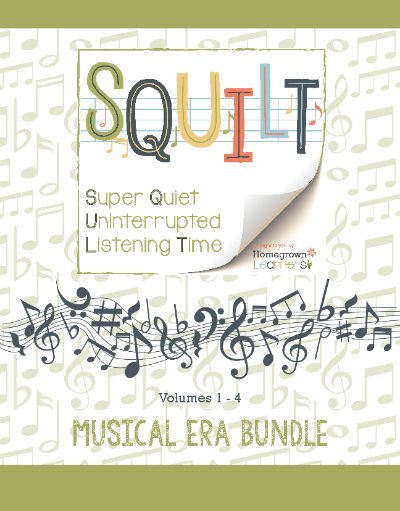 The Teacher's Guide includes discussion questions, maps, and vocabulary words. There are very few (if any) hands on activities or projects in the program (though you could add your own and many people do). It is pretty much all reading, mapping, discussing for Cores in Sonlight. This does not include Science. One weekly grid is shown on one page of type. It is historically based (so everything revolves around an historical time period). HOD gives a full-out daily program schedule/outline including: Scripture memory, Bible Study, Literature, History, Geography, Science readings, notebooking activities, plus experiments, poetry and poetry assignments, narration prompts, hands on activities and history projects, crafts, recipes - not to mention individual assignments that include copywork, art, sketching ... there are just way more things 'to do'. The daily spread takes up two pages of print. (See my snapshots in this post.) It is historically based also. 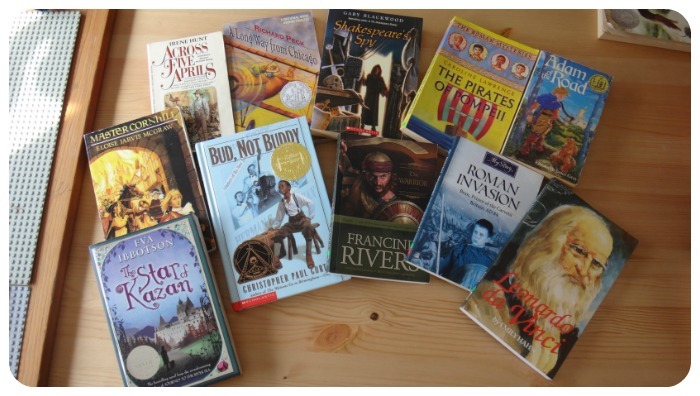 So, you can see how these programs could definitely compliment each other if you want a really rich curriculum for your kids with lots of reading and activities added in. Can I just interject with my two cents for Canadians? For example: Fellow Canadians - If you love Sonlight or Heart of Dakota but fear getting all messed up when it comes to years that focus on American History, let me encourage you. First of all -worry about one year at a time. Don't start worrying about 4 years in the future. Secondly - We actually ended up doing a massive amount of American History over the past two years and we LOVED IT. Don't write it off so quickly! I would highly recommend just doing the year or two of American History and adding in some Canadian History books... American History is FASCINATING and so connected to our own history. Thirdly - If you really don't want to do the American History years, there are ways around it by staggering and slowing down and adding in your own content to 'skip' forward in most literature based programs. Don't let it stop you from looking into these amazing programs just because they are American and you are Canadian. *smile* Ok, I'm done. A good friend was selling the Sonlight B+C Teacher's Guide for $20, so I happily bought it from her. (Thanks MC!) 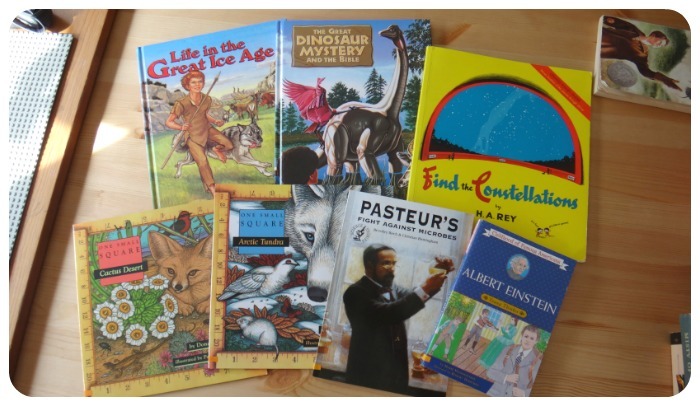 I then took the required books we already owned off the shelf and ordered the rest of the required titles from Amazon. For a couple hundred dollars Canadian, I had a Sonlight Core. B+C is a bit young for our age range but it uses the same spine as Heart of Dakota Preparing Hearts for His Glory - A Child's History of the World. They also cover the same time period - a sweep through all of history! So that is how I ended up with 2 programs. You don't need both. One would MORE than suffice... but I'm always filling in space and reading through the Summer and adding titles for Morning Time or evening reading. 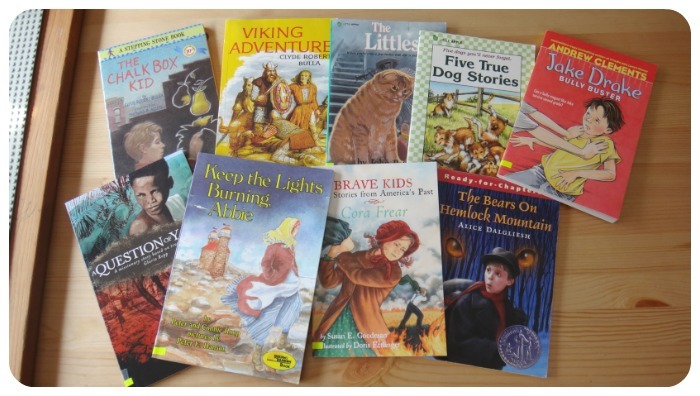 Our kids are accustomed to a ton of read-alouds, so getting lots of reading in isn't usually a problem. Also, in a nutshell, I'm a little crazy. This is a bunch of the titles from the 'basic' package. Draw and Write through History is optional but I knew my daughter would love it as an independent History study (it's scheduled in the guide). So, we absolutely LOVE the Hero Tales series (there are several volumes) from Dave and Neta Jackson. Volume 1 is included in the Preparing Hearts curriculum, but we own all 3 volumes. 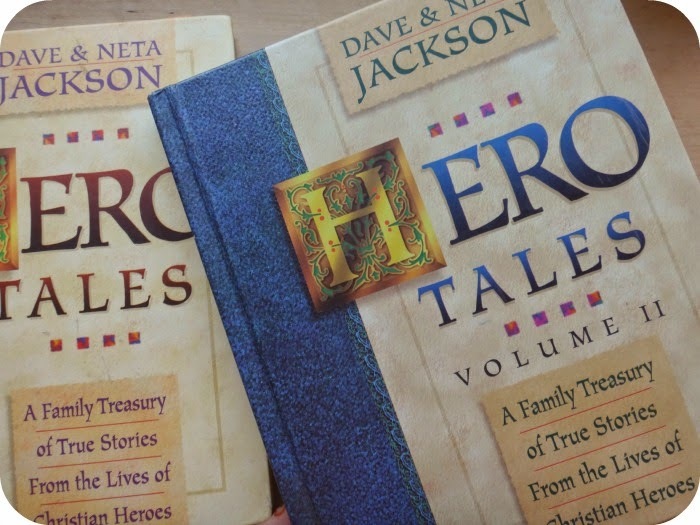 These are treasuries of inspirational devotionals based on the lives of heros of the Christian faith. Super well done and very engaging. I definitely recommend them for any family looking to learn more about faithful servants of God who have lived in the past and enjoy meaningful family devotions. So inspirational and also challenging! 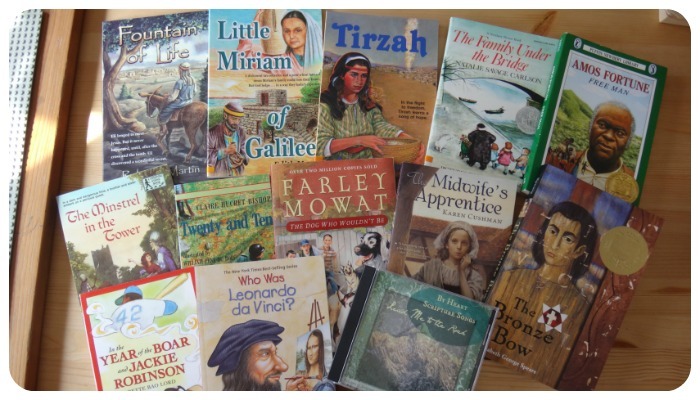 A Child's History of the World is a wildly popular history narrative among Classical and Charlotte Mason-inspired home educators. I like it. I don't LOVE it because to LOVE it, it would need to be Christ-centered, which it is not. It is a narrative of history and so well written, but written in a secular/neutral perspective, so I need to add commentary here and there. Still, a wonderful living book. Grandpa's Box is a spine too - and it is a creative walk through the redemption story using a Grandfather's heart-warming chats with his grandchildren. He focuses on the idea of Spiritual Warfare through the Christian perspective using the carved pieces he has created to illustrated the various parts of the account of Christ. More titles recommended by Heart of Dakota for Preparing and a few of my own choices mixed in. The Science package from Preparing Hearts. I'm missing one title from the One Small Square series... still on its way. All the Science is done with living books, notebooking pages, narration, and one experiment per week to go with what you are reading and studying. Science is scheduled into the guides but it is optional - I think you'd be missing out on a huge part of the program, however, if you didn't do the Science portion. It coincides with the historical timeline and time frame. 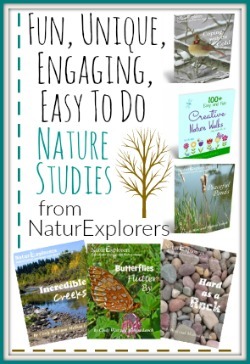 I'm used to doing a lot more outdoor, hands-on Nature Study but this works for us in this season. The two page spread show ONE DAY of the program. It is very detailed. I do add ideas for videos we can watch or additional maps or books to read, but I don't need to. The program is beefy enough already, especially with language arts, math, and various other things mixed in naturally. If you really want to see what these guides look like close up, you can download a free week of any of the levels at the Heart of Dakota website. Alright, I need to be completely honest, I'm a bit nostalgic about Sonlight. 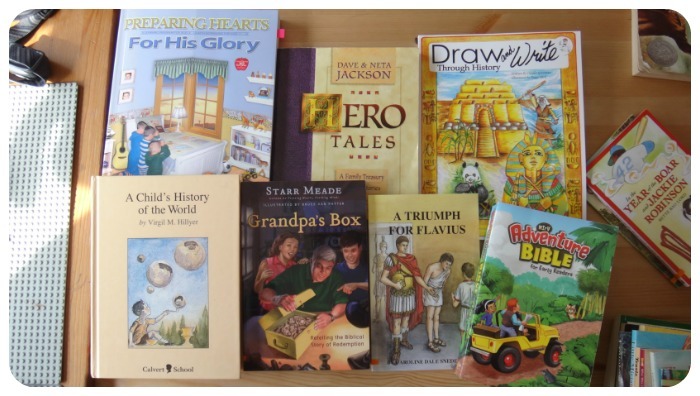 Sonlight was the first homeschool 'curriculum' I ever bought when I started homeschooling. The older two children actually worked through Core A (then called Core K) and Core B about 5 years ago. In the top photo: The Teacher's Guide, and several core books. One core not photographed is A Child's History of the World. 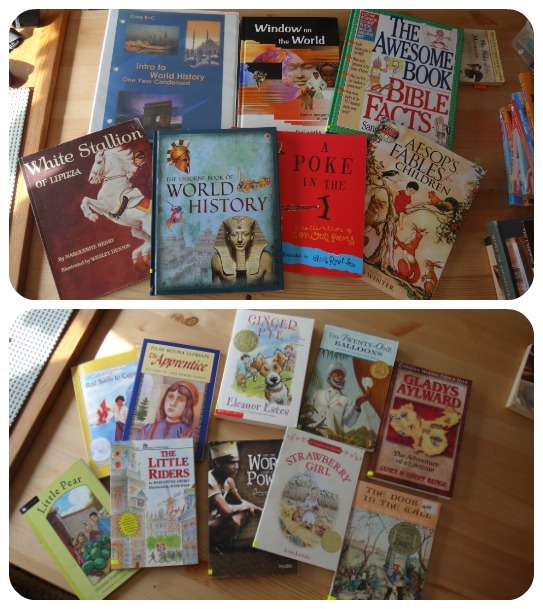 Bottom photo: Many of the read-alouds scheduled in Core B+C. So, although I LOVE Sonlight, I've never been very good at following their schedule... I want to follow it... but our family doesn't seem to be able to do it that well. This is a screenshot taken from the Sonlight samples section of their Core B+C listing on their website. This is the most current format of their Teacher's Guides. I LOVE that everything is so beautifully laid out with map prompts and timeline suggestions, and a wonderful daily mix of quite the 'feast' of literature. The problem for us occurs usually with the read-alouds... my kids aren't the best at reading only one chapter a day of a novel they love. They will beg to read more of the titles they love and less of the titles they don't love as much and it takes only a few weeks for us to get that beautiful schedule all muddy. So... what I've learned to do is relax and use the guide as what it is A GUIDE and not worry so much if we get ahead or behind. I just work through and add checkmarks where we've read the given title and discussed the questions/maps/timeline figures. Slowly but surely, it all works out. Alright, these are now the individual readers the kids will (hopefully) be using. I've chosen them based on their personal level, interests, and based also on the book lists I trust for readers. 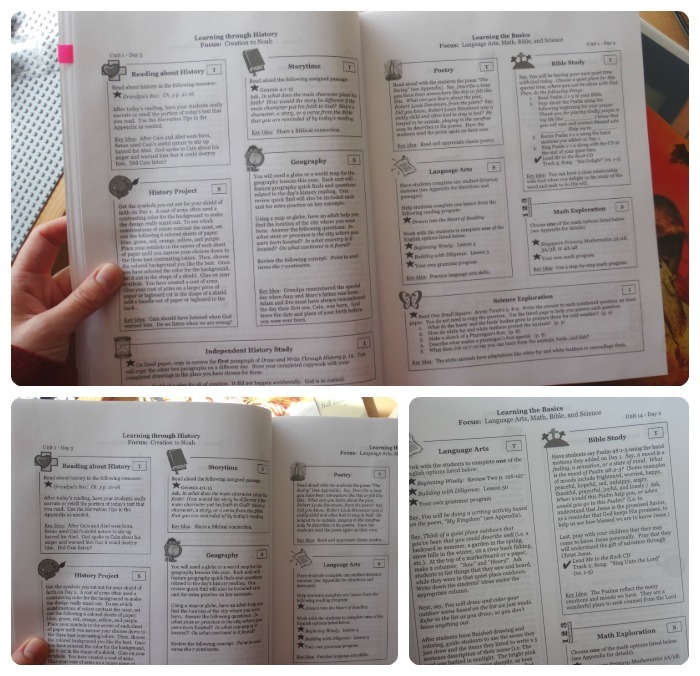 I used Sonlight's Grade 3 and Sonlight Grade 4 readers as a guide as well. 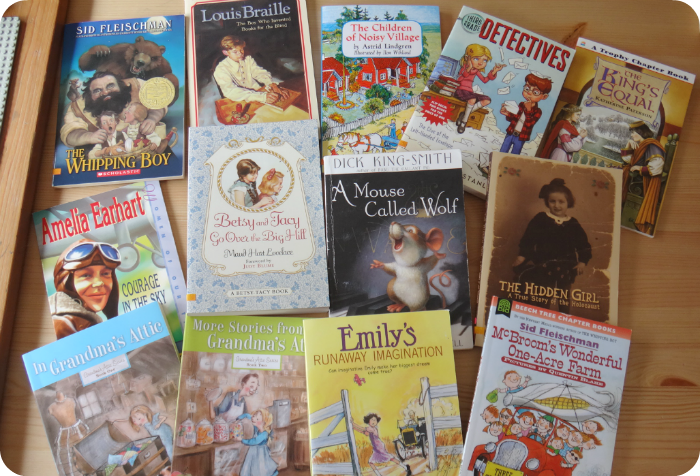 The kids will always read WAY more than their assigned readers, but these are books we will be intentional to read aloud together (the kids reading to me for the younger two) in order to improve our reading skills and comprehension. Alright... so if you are still reading this post... BLESS YOU! I know, I'm long winded! But it's homeschool planning... c'mon! I always get asked what we are doing for individual studies, so I thought I'd better add it here. 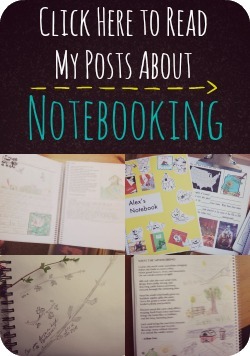 As for individual work, the kids are doing quite a bit of Notebooking, Narration, and some writing and projects, etc. through Heart of Dakota. 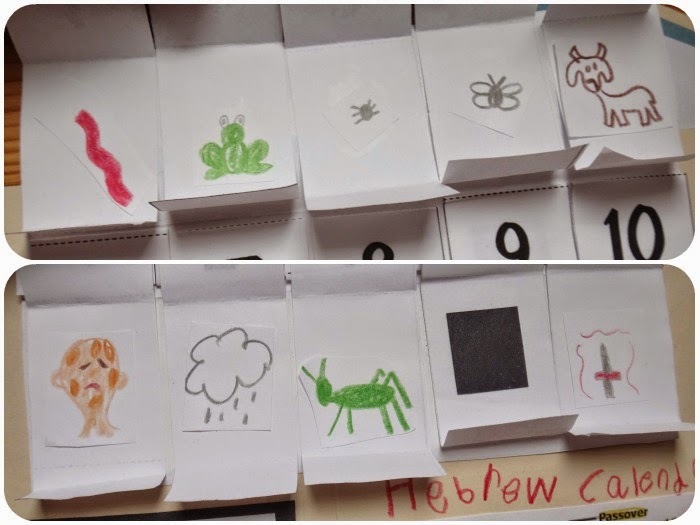 For example, every week they will do Copywork of the memory verse selection in their Common Place Notebooks, a Science Notebooking page, a Science Exploration page, etc. I really love Christian Light Publications. They offer such Godly, wholesome books and resources. I have ordered many books from them and always wondered about their Language Arts and Math, which I've heard great things about from friends. 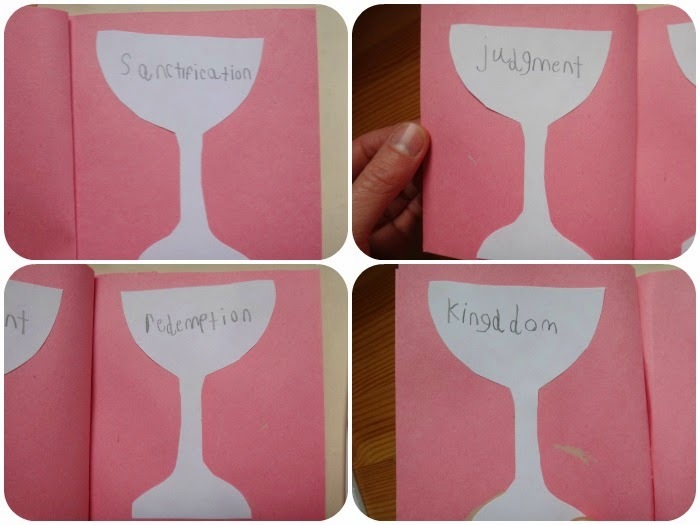 Just as a side, their Bible Curriculum looks amazing... I'd consider using it as a guide for family discussion and study or even allowing the kids to do their own level and then narrate aloud for some of the questions rather than having them become exasperated with too much 'writing' (for the boys anyways). 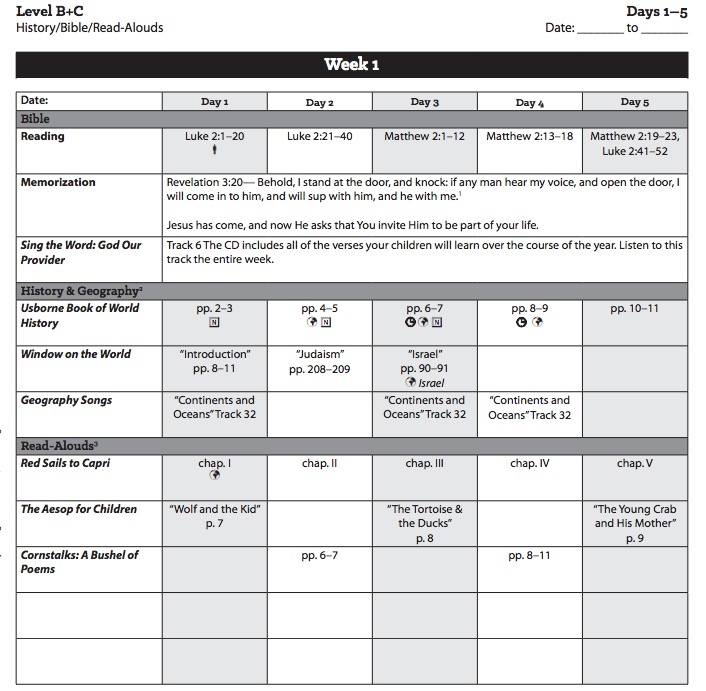 So, this year, we are doing Christian Light Language Arts with all three big kids. It isn't how we have typically done Language Arts in the past, but I actually love it. 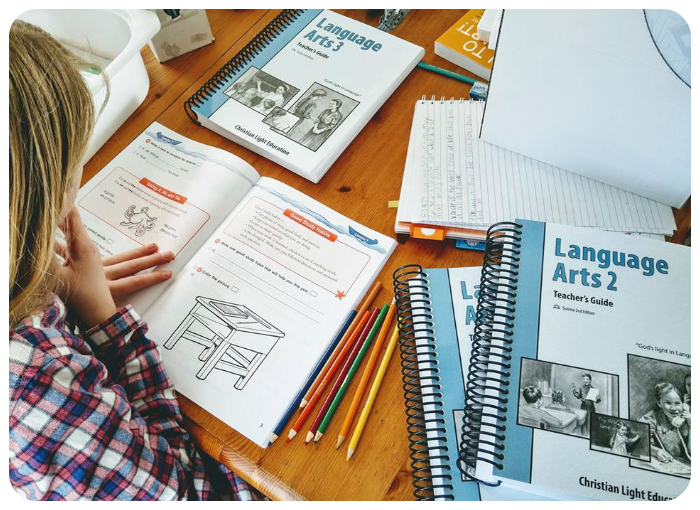 This is a workbook based Language Arts program that is extremely open-and-go. 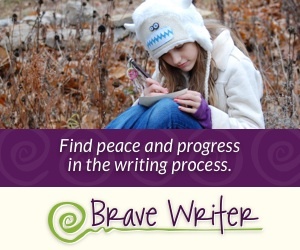 In these grades it includes spelling lists and activities, penmanship, grammar, and writing (though minimally). You can very easily work through the lessons just by following each step consecutively. The lessons say things like, "Go to page 62, cut out your spelling list, keep it somewhere safe... or, Underline the common nouns, circle the proper nouns..." etc. (See a sample here.) Some kids love this style. 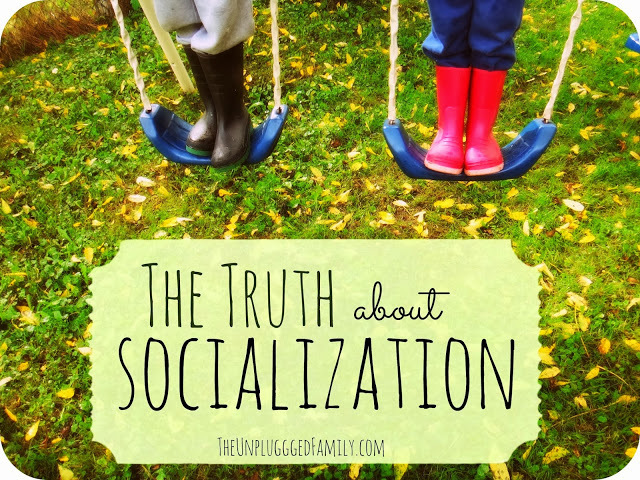 It is helpful for parents (like me!) who just want to open and go with certain subjects and also offer the kids a chance to take some initiative and work independently. I find this style of Language Arts helps with getting through content in a logical manner in which they can measure their progress. So, reluctant workers can see they need to accomplish Lesson 5 and can visibly understand how much is included in this work. Sometimes I compromise and do a bit orally rather than having them write as much as my daughter likes to write. This is much different than the super free-spirited style of Language Arts we've embraced in the past where my kids would always be asking me, "are we done yet?". Now, they can see when they are done and it isn't me making it up as I go. 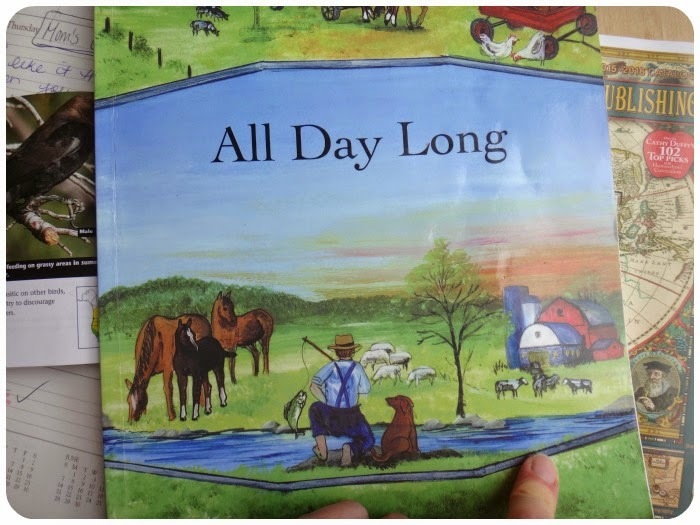 It is a book telling us when we are done for the day. It's kind of nice. 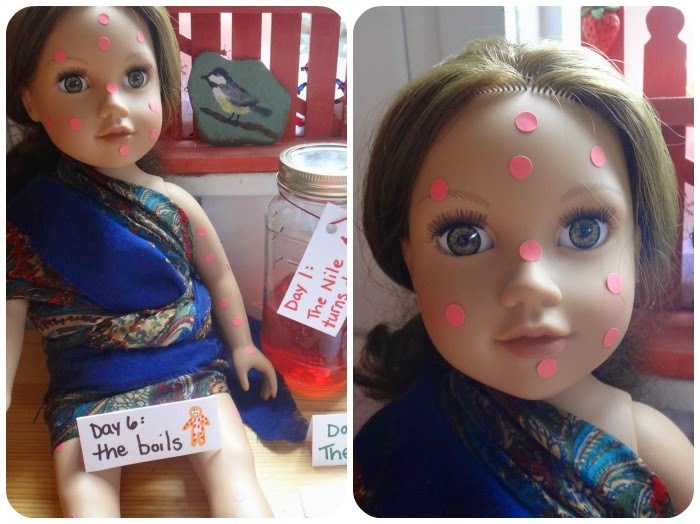 The 'tests' have actually been enjoyed by the kids (go figure, after 7 years of never implementing a single test in our homeschool... they LIKE it...). I've seen progress already in my youngest son's handwriting and the kids' spelling overall. The boys do willingly accomplish these books and my daughter enthusiastically embraces them. She woke up one Saturday recently and begged me to 'let her do her tests' because she was SO looking forward to them and didn't want to wait until Monday. *HAHA! * I love her. Her brothers just think she's completely nuts. Copywork has somewhat run its course in our home. I think my kids are actually getting tired of it and I am a little bit as well. 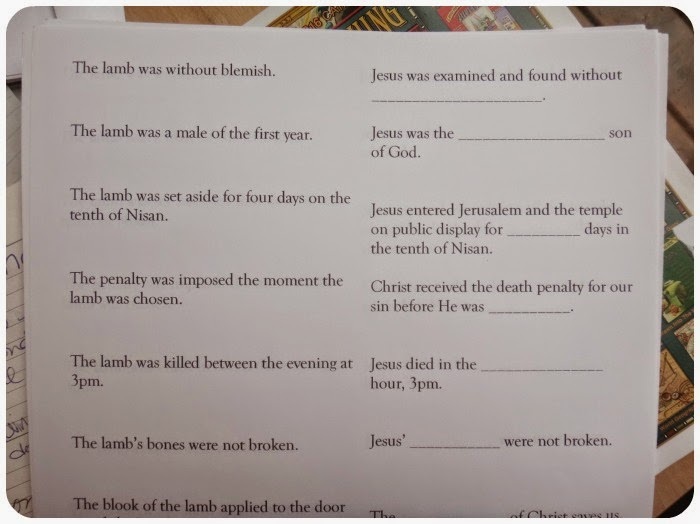 However, they will do one copywork assignment per week based on the scripture memory work for the week. This they will copy in their Commonplace Book. Dictation has been of huge benefit to our children over the years. I know they have learned a ton from it because I didn't do any other spelling for years and my kids are decent spellers. For Dictation, we are using the Dictation Day by Day passages at the back of the Heart of Dakota Preparing guide for Alex. This is a resource that is available for free online. We are also using Spelling Wisdom and Using Language Well for Audrey and Simon. 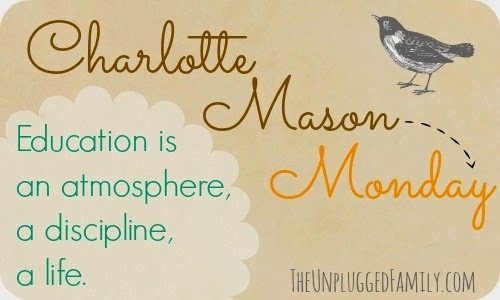 A review of this Simply Charlotte Mason resource is coming next week. These are dictation exercises (Spelling Wisdom) coupled with short, easy grammar lessons that go with the dictation. We have done Teaching Textbooks for Years and will continue to use Teaching Textbooks for as long as it is working well for our children. 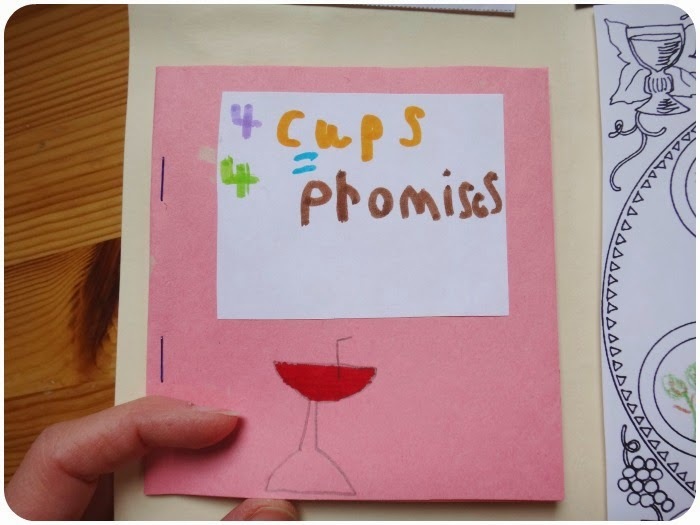 I love this program because I have the option of implementing the computer-based program or the kids can opt to do their workbooks. If the children did the computer program, it would be entirely independent. They are touch and go with the computer component but I do encourage them to use the computer based part of the program because it is what the program is based upon and it cost me a fortune! It's also really well done and engaging. Mind you, once you own the CDs, you can use them over and over and add students as needed. To be honest, part of me wishes I had of never bought the textbooks, but rather, just bought the CD-Roms. The reason is because it would force the kids to use the computer program and simply write questions in a spiral notebook. The computer takes a little longer, yes (their biggest beef) but that's because you are actually covering the material more thoroughly. This year, Simon is in Math 6, Audrey is in Math 4, and Alex is in Math 3. 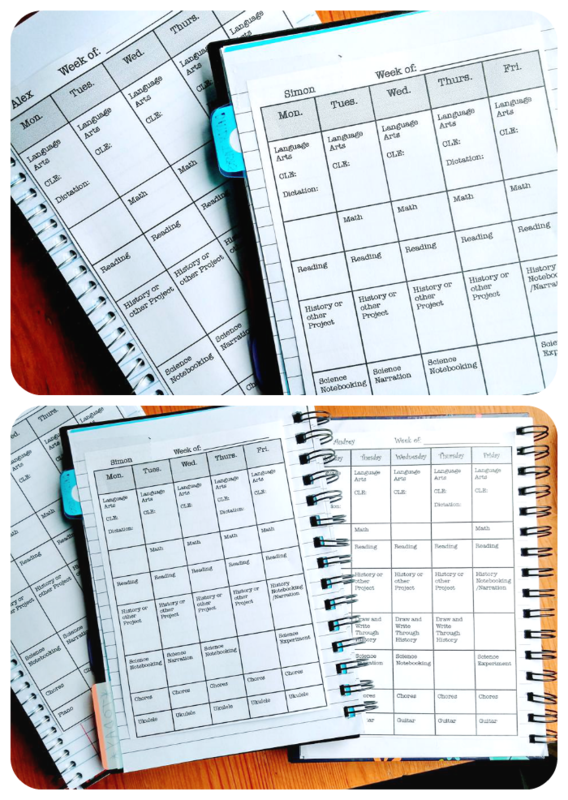 I adopted the Spiral Bound system for daily planning/records of the kids' individual work a few years ago. It's helpful in letting them know what is expected of them individually. I've adapted it as we go along. Typically, parents would write out what is needed for the task list the next day (like a daily hand-written bullet list). I LOVE the idea of hand writing their work but, boy, have I have struggled with actually getting 3 lists written out every night. I either forget, can't remember what to put on the list, or write the wrong thing. I als find it very repetitive as they do much of the same thing every day. This year, to simplify, I created weekly grids for each child to be able to easily see and check off the work they need to do every day of the week. There is a little space for me to jot in specifics too. 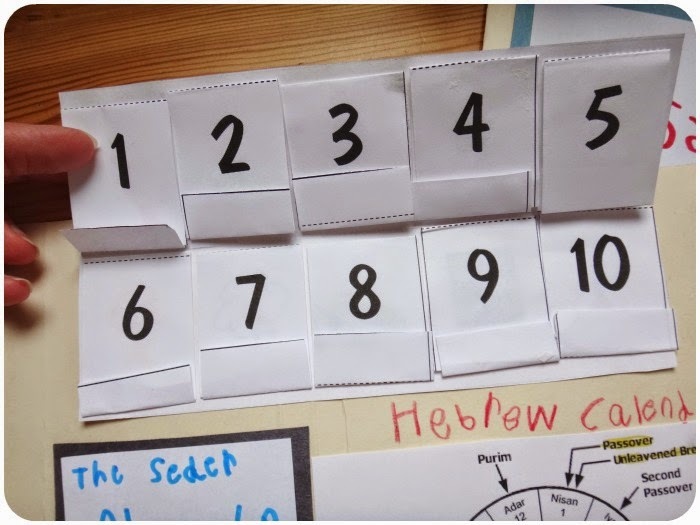 These print outs get glued into or taped into their little spiral notebooks. A fresh one goes in each week. This is for their individual work and does not include our family learning, which makes us a good portion of our day. That information is in my own planning binder (the Teacher's Guides). I love using the Plan Your Year resources. They are a great planning springboard and super helpful. 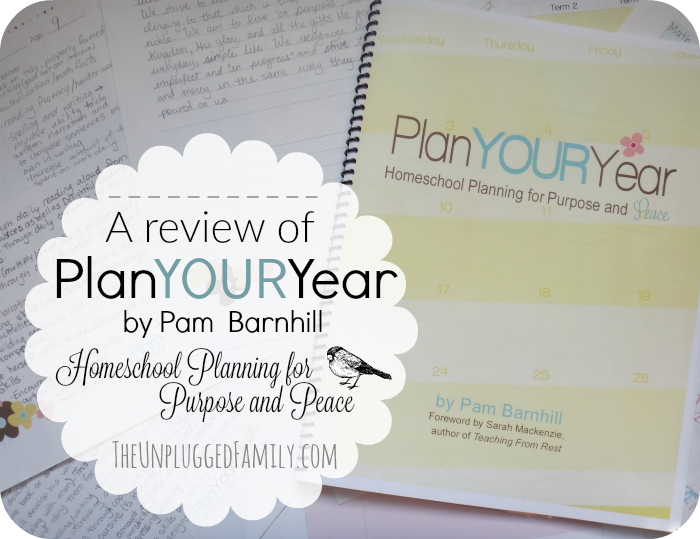 You can see my review of Plan Your Year right here. 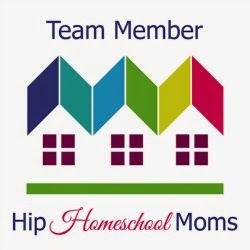 It is honestly a great resource - one of the best I've seen for planning homeschool. 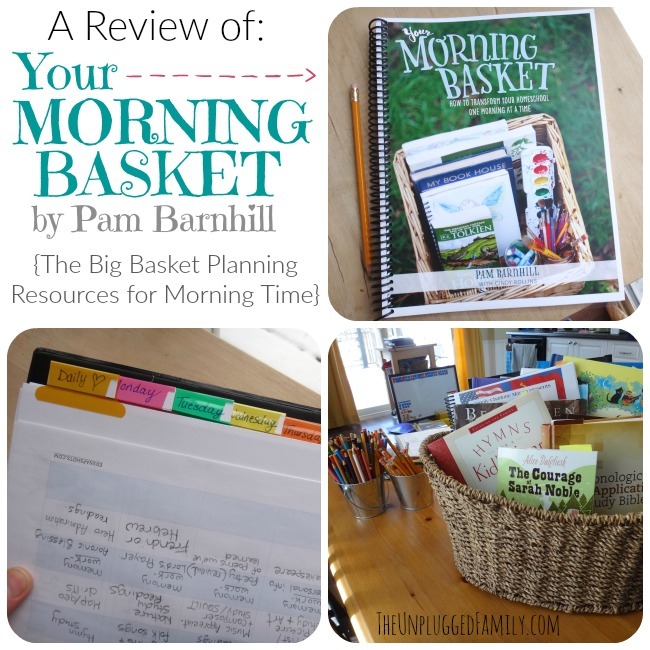 I've also shared Morning Time resources many times before and highly recommend the Your Morning Basket resources! This space is a reflection of one imperfect girl's heart and one simple family's journey to walking in freedom and grace. Join us as we embrace life outside the 'box'. Unplug Your Family. Powered by Blogger.